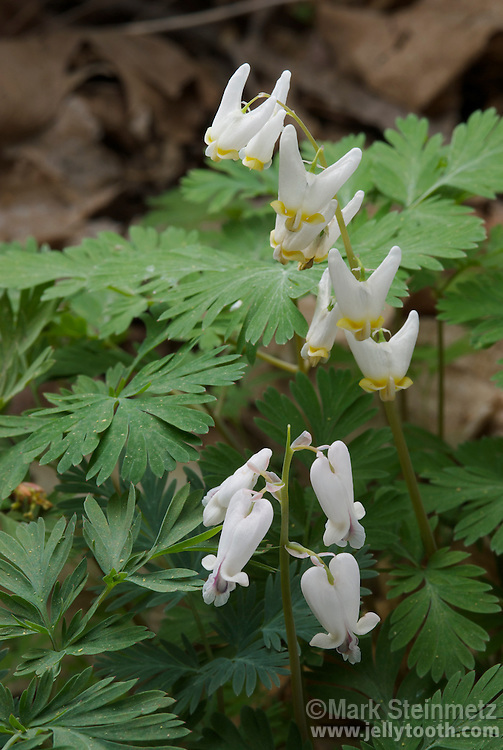 Dutchman's Breeches (Dicentra cucullaria) and Squirrel-corn (Dicentra canadensis). These two closely related wildflower species, which favor a similar habitat and can sometimes be found growing side by side, are commonly confused with each other. The flowers of Dutchman's Breeches (top) resemble upside down pants once worn by Dutchmen, while the flower of Squirrel-corn are more rounded and heart-shaped. Both are native to eastern North America. Franklin County, Ohio, USA.